Police Report: A couple attempted suicide together inside their house, the husband passed away while the wife is currently fighting for her life in a hospital at Kota. 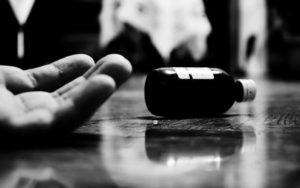 Manoj Kumar Sikarwal, the In-Charge of the Gumanpura Police Station said that 25-year-old Khushpreet Singh and 22-year-old Jyoti took poison on Monday morning as an attempt for their joint suicide pact inside their rented room. Jyoti and Singh were both brought to the Maharao Bhim Singh Hospital by their neighbours and the landlord after they got to know about the incident. 25-year-old Khushpreet Singh passed away in the hospital, while Jyoti is still admitted in an ICU at the Maharao Bhim Singh Hospital, the doctors said that she is still in a critical condition. 25-year-old Khushpreet Singh was from the Jawahar Colony in Faridabad, 22-year-old Jyoti was from Lakheri, Bundi. The police said that the couple got married 6 months ago. The police also recovered a suicide note from the residence of the couple, in the note the couple said that they are taking the step out of their free will and no one is responsible for their step. An empty poison bottle was also found inside their residence. The police added that the Jyoti and Singh were both studying in Kota when they met each other and got married in 2018. 25-year-old Khushpreet Singh was working in a private company while 22-year-old Jyoti was studying nursing. The police said that the parents of the couple have been informed about the incident.